wounding if the the walleye bites about done caught a few on big birch but there very slow. anyone think thats true? They aren't done I am still iceing them. The eye's are definately a little more sluggish right now. Fishing at peak times and downsizeing your lures and bait will definately help ice some eye's. Definitely true. I've had some of my best walleye outtings shortly after the season closed fishing for crappies. Downsize and you'll have more action. 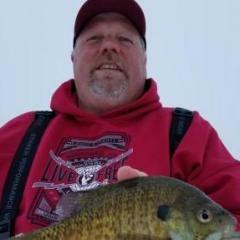 Ill definitely give a smaller lure and bait a try and see if I can get some more walleye pulled through the ice. I totally agree with the others! Even fishing pannies they come up look and leave,down size and normally you can get them. And to be truthful I think the most and biggest walleyes I have caught have been on crappie hooks and minnows. I agree 100% caught a 3 pounder the other day on a tiny crappie minnow and hook, it bent the hook if i wouldnt have stuck my hand down the hole probably would have lost it. Made for some fun though.